This tenderloin is quite the charmer, as it moves from dinner parties, to family meals that yield days worth of sandwiches, to date night (who doesn’t love meat and potatoes…and wine…). The simplicity of preparation belies the complexity of flavor and sumptuousness of texture – like your favorite lipstick on a tossed-together-day, this dish moves your table from dim to dazzling with shockingly little effort. Preheat oven to 475. Bring Tenderloin to room temperature, at least 30 minutes. Fold the tail under, and tie meat horizontally with twine every 2 inches. With a mortar and pestle crush peppercorns and add salt. 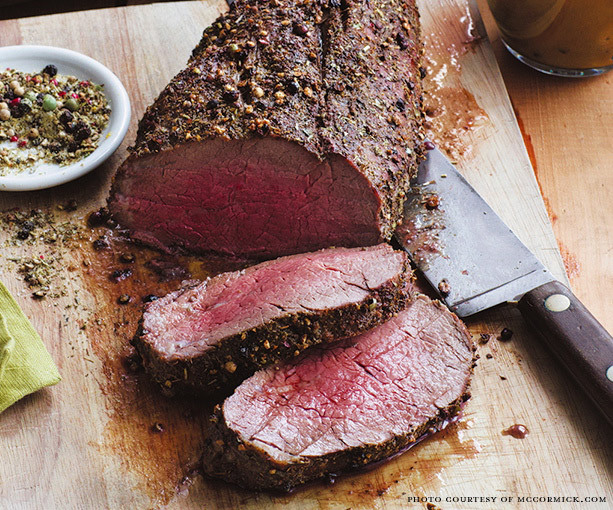 Coat all sides of beef. Melt oil and butter over medium high heat. Sear beef on all sides, 2 minutes each side to get a nice dark brown crust. Put tenderloin on a roasting rack, and cook for 30 minutes or until meat thermometer hits 130 for medium rare. Tent and rest for 15 minutes. Slice against the grain. devour.